Until now, ulcers and lesions inside the mouth have been treated using either creams or mouthwashes, which are used in the whole mouth rather than targeting the specific area, making them less effective. However, the biodegradable Rivelin patch, has a long adhesion time and a high flexibility which conforms to the surface inside the mouth. Dr. Craig Murdoch, Reader in Oral Bioscience School of Clinical Dentistry and lead author of the research, said: "Chronic inflammatory conditions such as OLP and RAS, which cause erosive and painful oral lesions, have a considerable impact on quality of life. "Current treatments consist of using steroids in the form of mouthwashes, creams or ointments, but these are often ineffective due to inadequate drug contact times with the lesion. 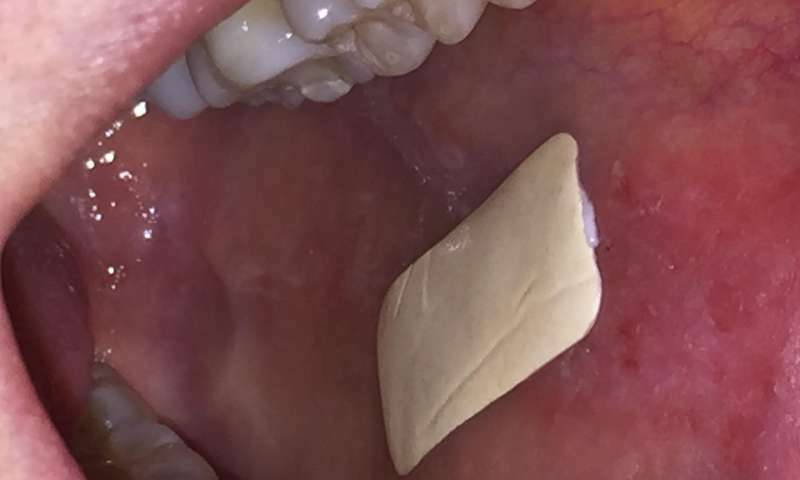 "The patch acts like a plaster inside your mouth, which means it is very effective at directly targeting the specific area as well as forming a protective barrier. "Patients who have trialled the patch found it to be very comfortable to wear and they were really pleased with the length of adhesion which makes it particularly effective and efficient." Jens Hansen, Chief Executive Officer at Dermtreat A/S, added: "Collaboration with the University of Sheffield has undoubtedly accelerated the translation of our intellectual property towards clinical use. Our company are very confident that we will soon gain regulatory approval for the first adhesive drug delivery technology to address pressing clinical needs in oral medicine. "We look forward to continuing this collaboration, which will be increasingly directed at finding new clinical applications for muco-adhesive patches." Dermtreat A/S was recently awarded $17.7 million from the venture capital firm Sofinnova. The funding will take the patches into phase two clinical trials, which will run at several sites in both the US and the UK—including at the Charles Clifford Dental Hospital in Sheffield. In addition, Dermtreat are funding further research at the Dental School to develop the next generation of patches that contain other useful drugs. The findings of the research are published in the journal Biomaterials.